The Tarfful figure was a huge letdown for me. The figure had a silly paint job, and the knees should have been articulated like the Sneak Preview Wookiee Warrior. If anyone wants to make their Tarfful have better articulated knees, it's actually a very simple custom to do. You need to boil and pop his knees off, and replace with the Wookiee knees. Do a bit of repainting - and presto. It is a shame that Hasbro makes so many figures like that, that are so close to being a good figure then they give it a stupid feature... why in the world they gave Tarfful those stupid swivel knees is beyone me. i picked up one set of figures #41-44 today at wal-mart. i found one fresh case that included one each of #41-44, one each #33-36 (red saber palpy), and if i recall one each of #1-3 (gaahhh!) and #9. the one thing of interest is that the #41 clone has a dirty / battle damaged type of paint app. i assumed this was going to be clean like the #6 clone because i didn't hear anyone mention otherwise. sorry for the same post in the recent purchases thread but i thought it might be appropriate here also. I don't like that the #41 clone is 1 per case, but at least they're shipping him in another wave. Here's what Hasbro should be doing once this case has been out for a while. I don't know what it is going to take for Hasbro to wake up and realize that 2 PER CASE OF A CLONE IS NOWHERE NEAR ENOUGH! Galactic Hunter has some pics up (carded and loose) of the upcoming assortment featuring Commander Bacara, R2-D2 (with lights and sounds), and Anakin on Mustafar (with interchangeable head/arms). I'm really looking forward to this assortment, hopefully it won't be too tough to find. Now if only Hasbro would release some of the Snowtrooper like soldiers to go alongside Bacara . Check out the pics at the linky above. I must have that Anakin on Mustafar. I don't care for the hood up version but the battle damage it pretty cool. I think. I'm really looking forward to someone actually getting ahold of the Mustafar Anakin and doing a review so I/we can know how the whole thing hooks together. Right now, judging from the photos, it looks as if the "Okay" Anakin might be along the lines of the Deluxe Anakin in that the cloak/head/arms might all be one piece and fit over the "Scorched" Anakin body. If it's done well, I have no problem with this, but if it's done like the Deluxe Anakin's Vader helmet/cape, I'm going to be a little perturbed. Oh well, at the very least I'll have burnt to a crisp Anakin. I'm just hoping his legs are removable (they look as if they are jointed at the boots, so they could be). Right now, judging from the photos, it looks as if the "Okay" Anakin might be along the lines of the Deluxe Anakin in that the cloak/head/arms might all be one piece and fit over the "Scorched" Anakin body. Your description is definately the way it looked to me at C3. You pop the arms (and maybe the head) off the "scorched" Anakin and the Cloak/Head/Arms peice snaps over the top for "Evil" Anakin (Darth Vader) on Mustafar. 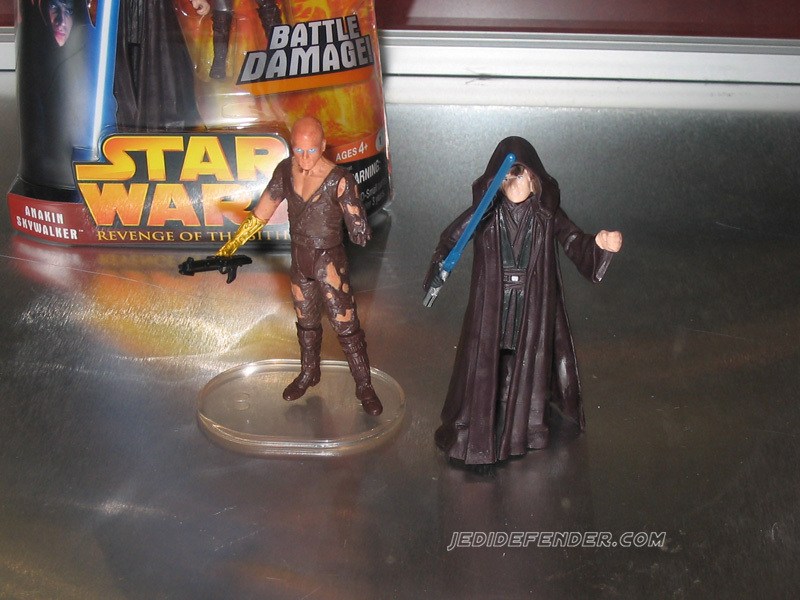 That is why his lower legs are unscathed on the "Battle Damage" figure, so they look normal on the un-damaged Anakin. These things keep coming one after the other. What will this assortment look like? (With Ask Ack (?) I suppose). #45-47 (tarkin, Mon Cal, Aak Aak) will be the next wave in collection 2. You can find a bit more info in this Thread.